Muvi is the only end-to-end solution available worldwide for launching your own-branded Multi-Screen Video Streaming Platform. 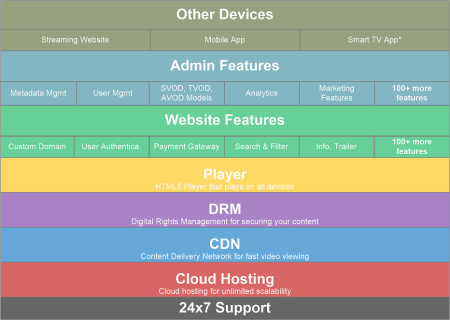 Diagram illustrates different components of video on demand technology that go into building a Video Streaming platform. Most other products offer only 1 or 2 of these components, you have to build the rest. For example, Brightcove and Ooyala offer just a CMS and video player which is less than 10% of the total effort, you still have to build rest of the website, host and maintain it. Muvi offers the entire solution for a simple, low price. Nothing else required.